Advertising agency Young and Rubicam (Y&R) developed a model of brand equity called Brand Asset Valuator (BAV). Based on research with almost 200,000 consumers in 40 countries, BAV provides comparative measures of the brand equity of thousands of brands across hundreds of different categories. There are four key components—or pillars— of brand equity, according to BAV. Differentiation measures the degree to which a brand is seen as different from others. Relevance measures the breadth of a brand’s appeal. Esteem measures how well the brand is regarded and respected. Knowledge measures how familiar and intimate consumers are with the brand. Differentiation and Relevance combine to determine Brand Strength. These two pillars point to the brand’s future value, rather than just reflecting its past. Esteem and Knowledge together create Brand Stature, which is more of a “report card” on past performance. Examining the relationships among these four dimensions—a brand’s “pillar pattern”—reveals much about its current and future status. Brand Strength and Brand Stature can be combined to form a Power Grid that depicts the stages in the cycle of brand development—each with its characteristic pillar patterns—in successive quadrants. New brands, just after they are launched, show low levels on all four pillars. Strong new brands tend to show higher levels of Differentiation than Relevance, while both Esteem and Knowledge are lower still. Leadership brands show high levels on all four pillars. 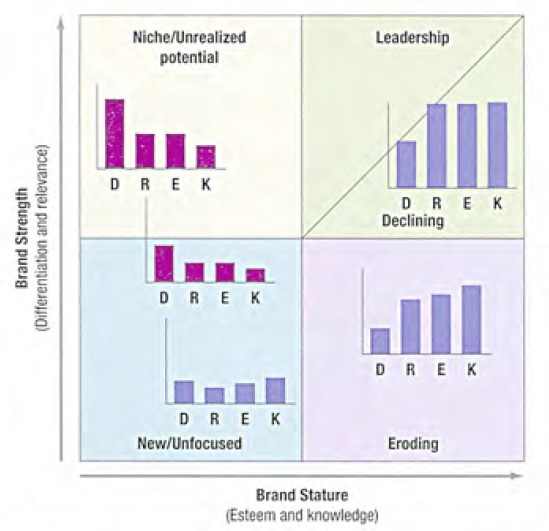 Finally, declining brands show high Knowledge—evidence of past performance—relative to a lower level of Esteem, and even lower Relevance and Differentiation. what year was brand Asset valuator propounded by young and Rubicam? Brand Asset Valuator Model (BAV Model) was propounded by Young and Rubicam in 2003.